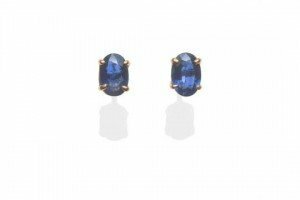 A Pair of 9 Carat Gold Sapphire Stud Earrings, the oval cut sapphire in four claw settings, with post fittings for pierced ears. 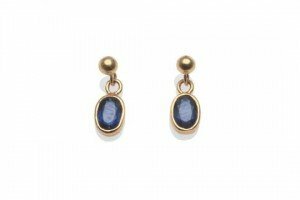 A Pair of Sapphire Drop Earrings, a ball stud suspends an oval cut sapphire in a yellow collet setting, with post fittings for pierced ears. An Enamelled Pendant, the drop shape enamelled in blue and green colours, with a mother-of-pearl oval set centrally, and a second suspended from the base. Two 9 carat gold diamond and gem-set pendants. 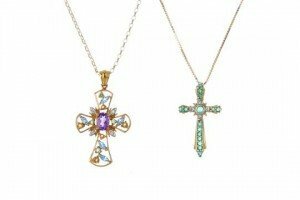 To include an emerald and diamond cross pendant suspended from a box-link chain, together with a diamond and multi-gem cross pendant suspended from a belcher-link chain. 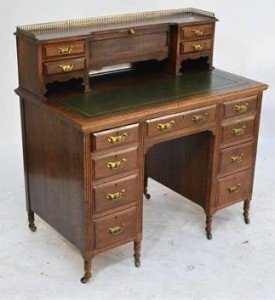 An Edwardian oak kneehole desk with raised superstructure and arrangement of nine drawers to the base raised on ring turned legs to brass caps and castors. 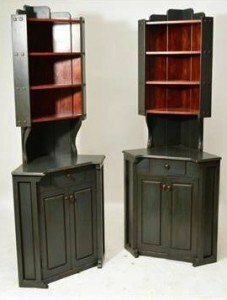 A pair of painted pine freestanding corner cupboards with open upper sections and base set with single drawer above twin cupboard doors. 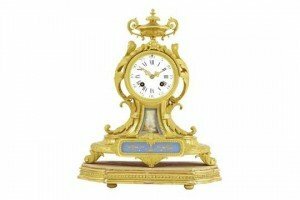 A French porcelain mounted ormolu mantel clock, the white enamel dial with faded signature of ‘Grohe, Wigmore Street, London’, striking movement stamped ‘G.V. no. 1214’, in a waisted acanthus scrolled case set with blue plaques with urn finial, 31cm high, with a giltwood stand. 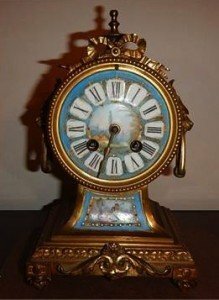 A mid 19th century French balloon mantel clock, the ormolu case having turned finial top, ribbon and mask loop handles around a 4″ painted porcelain dial waisted stem with further panel of a shepherd and shepherdess, cast base with lappets and acanthus scrolling, turned floral feet, the eight day cylinder movement striking a bell. 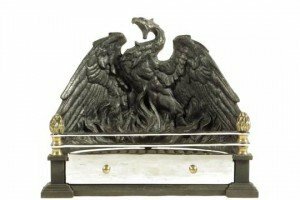 A cast iron and polished steel fire-grate, with brass mounts, the curved back carved with a phoenix rising from the flames to a bar front with flame finials and above a frieze ash drawer. 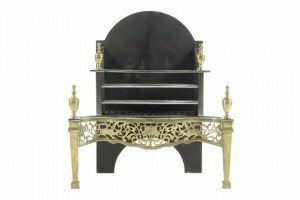 A George III style polished steel and brass fire-grate, the arched back above a railed serpentine front and a pierced frieze with turned urn finials. 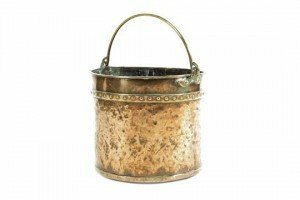 A late 19th century Dutch copper log bin, with a brass swing handle and a riveted body, 32cm high, 40cm diameter. 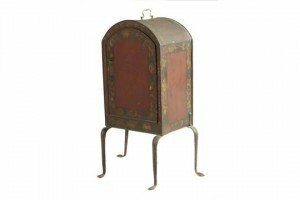 A George III tole peinte plate warmer, of arched form painted with bands of flowers, the top with a brass handle above a door enclosing three shelves and on cabriole legs and circular pad feet. 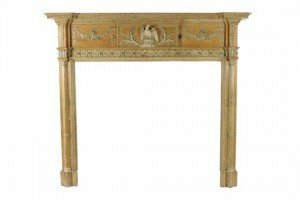 A George III Scottish pine and gesso chimney-piece, the inverted breakfront mantel above swag mouldings, the frieze centred with an eagle with thistles and flanked by panels of ribbon tied swags of vine leaves, grapes and flowers, the uprights with cluster column pilasters. 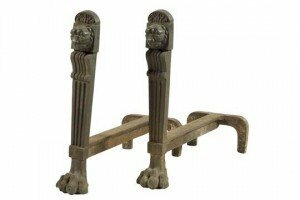 A pair of cast iron andirons, each decorated with a lion’s mask above a fluted tapering column and a paw foot. 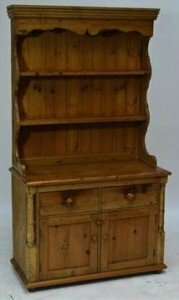 A pine dresser of small proportions with boarded plate rack and base of two drawers and two cupboard doors. 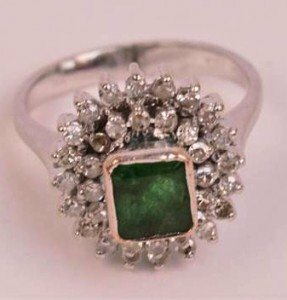 A white metal emerald and diamond cluster ring, the raised central rectangular emerald within a double stepped row of diamonds. 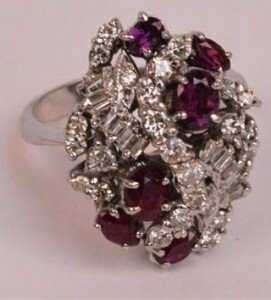 A white metal diamond and ruby cluster ring, the lozenge shaped platform stepped with various cut diamonds interspersed by six rubies in high pierced claw setting. 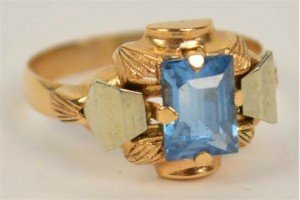 An 18ct yellow gold and white metal Art Deco style ring set with a square blue stone in stylised setting. 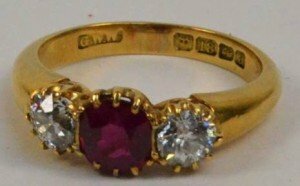 An 18ct gold ruby and diamond three stone ring, the central ruby weighing approximately 0.65cts flanked by two diamonds weighing approximately 0.30cts in pierced setting. 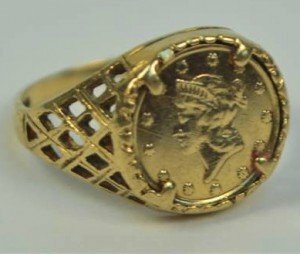 A 9ct yellow gold signet ring set with a miniature medallion depicting a Roman head to one side and a Mother Mary to the other, in pierced setting.